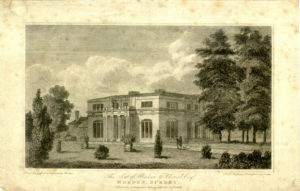 Engraving of Morden Lodge, ‘The Seat of Abraham Goldsmid Esqr, Morden, Surrey’, published 1806. 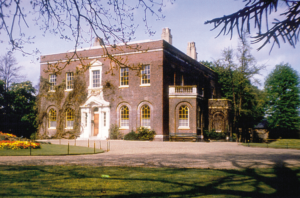 Jewish financier Abraham Goldsmid (see Bulletin 138) built the spectacular Morden Lodge on the site of the former Tudor mansion Growtes. He was a frequent visitor at Merton Place and entertained Nelson and the Hamiltons at his home, decorated by the fashionable John and Frederick Crace. He shot himself in the grounds of Morden Lodge in 1810 amid fears of financial ruin. The late 18th and early 19th centuries was a period of gentrification, with large estates formed around impressive mansions. Morden Hall dates from around 1750, and Morden Park from 1768-9. 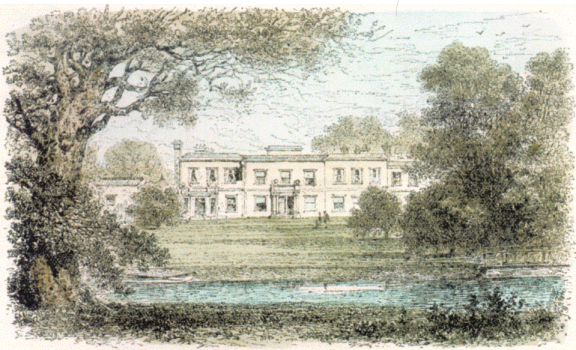 Morden Hall (see Bulletin 185) was occupied as a school between 1830 and 1870, artist G A Storey (see Bulletin 147) being one of its pupils. Morden Park remained a private house until 1930, and an inventory of 1867 (see Bulletin 117) indicates something of the mode of life in a gentleman’s country residence of the time. During the 1870s the Garths advertised their Morden estates for sale (see Bulletin 170), and they were purchased by Gilliat Hatfeild, a tobacco and snuff processor whose family had run the snuff mills in the grounds of Morden Hall since 1831. His son, Gilliat Edward, who inherited in 1906, sold Morden Park to the Urban District Council in 1936 as a permanent open space. When he died in 1941 he left his Morden Hall estate to the National Trust. The cottage which forms the centre of the present ‘Manor House’ retirement home, between St Lawrence church and the George, was built between 1745 and 1782, though it was never the manor house. It was built on a former copyhold croft, probably dating from late Saxon times. Church Farm Cottage, on the other side of St Lawrence church, is said to have been built in 1813 and is all that remains of the farm originally created out of manorial demesne land in the late 16th century. An engraving (see Bulletin 140) reproduced in Canon Livermore’s 1968 edition of The Story of Morden and its Churches, and captioned London Road, about 1760 , shows the view from north of the church with only two other buildings visible. By 1770 several cottages had been built along this stretch of road, probably associated with the creation of the Morden Park estate. During the 1770s the farms in the Lower Morden area were reorganised, and most of the land was divided among four large farms. (see Bulletins 129, 132, though the medieval identities suggested in these articles have since proved to be incorrect!). Instead of the scattered small fields which had developed over the centuries, the fields attached to the new farms were in more compact blocks. Many of the earlier farmsteads became cottages for the farm workers. There were isolated pockets of development in the 19th century. 12 cottages built by 1869 at the southern end of what is now Garth Road served a brickfield on Morden Common. Thomas North built corrugated iron clad cottages in Crown Lane, opposite 19 dwellings built in the 1890s for workers at John Innes’s brickfield. A "melancholy occurrence" (see Bulletin 119) involving a fatal fire at the Crown inn was reported in The Times in 1839. Joseph William Bazalgette (see Bulletins 142, 154), engineer to the Metropolitan Board of Works responsible for building London’s sewers, lived at Union Villa (later called The Willows) in Central Road in the 1850s and 1860s, before moving to Wimbledon. The Vestry Minutes record the Beating the Bounds of Morden (see Bulletin 146) in 1882.
dating from the 1860s to the1940s at the National Library of Scotland website. A range of viewing options are available, including Side by Side – a scrollable and zoomable display of the 1890s-1920s series alongside modern satellite images or road maps.